Artist Blessing Hancock oversees installation by skilled fabricators and installers from Gizmo Art Production. Lantern’s interior contains LEDs that provide programmable multi-colored illumination. 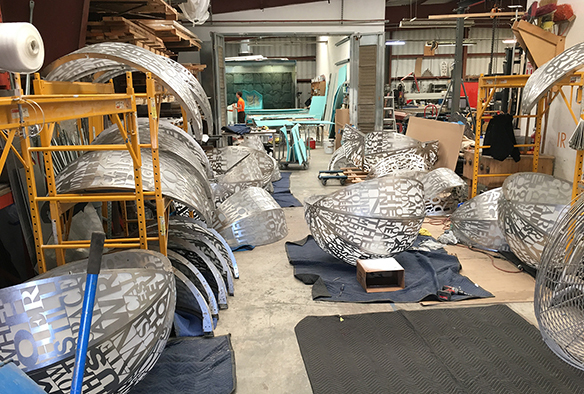 Nicollet Lanterns at the studio of Gizmo Art Production in San Francisco, CA during the final stages of fabrication, assembly and testing. 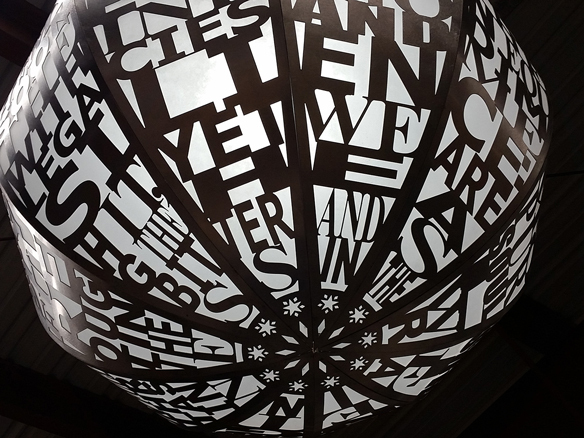 Nicollet Lanterns by Blessing Hancock, a series of vibrant, illuminated sculptures suspended along Nicollet Mall between 6th and 8th Streets, is comprised of twelve spherical forms, each a unique design featuring the text of a poem by a Minneapolis writer. 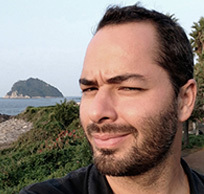 Junauda Petrus, Moheb Soliman, Sagirah Shahid and R. Vincent Moniz, Jr. (Nu’Eta) have each created three 100-word poems especially for the project. 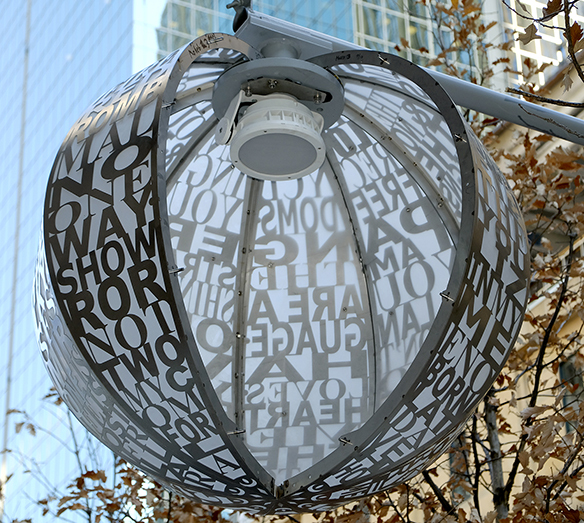 The lanterns speak to the city’s diversity and celebrate each poet’s perspective and viewpoint. 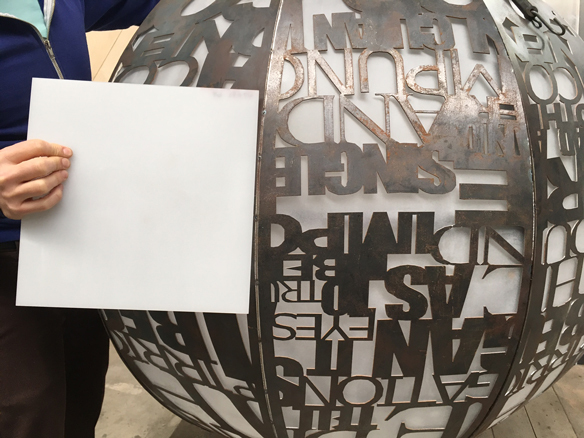 The surface pattern of poetry text presents an ever-changing visual experience depending on a pedestrian’s point-of-view, allowing new associations to be created between words. 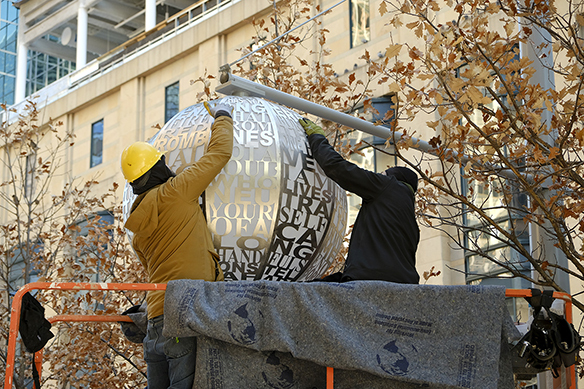 Poem by Sagirah Shadid translated to the sectioned, spherical form of Nicollet Lanterns. 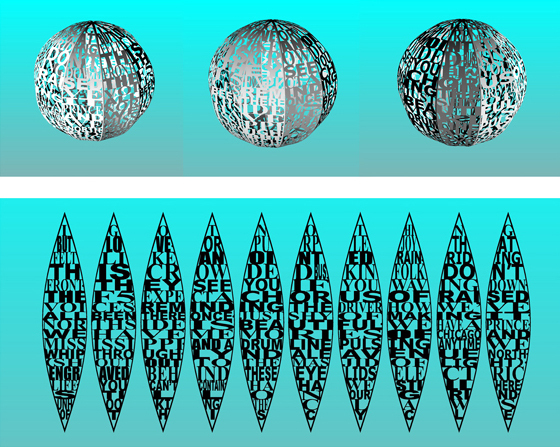 Bottom image for lanterns incorporating poems by Sagirah Shahid. Mock-up enabled selection of text font and size and determined readability of text. 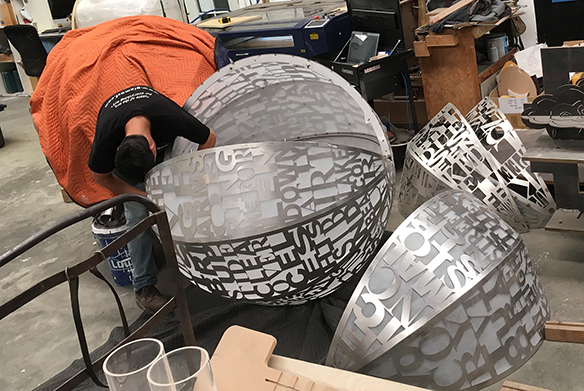 The four-foot diameter spherical forms are constructed of 1/16”- 316 stainless steel sheet stock with water-jet cut text and 1/16” sanded acrylic panels line the inside of the steel forms. 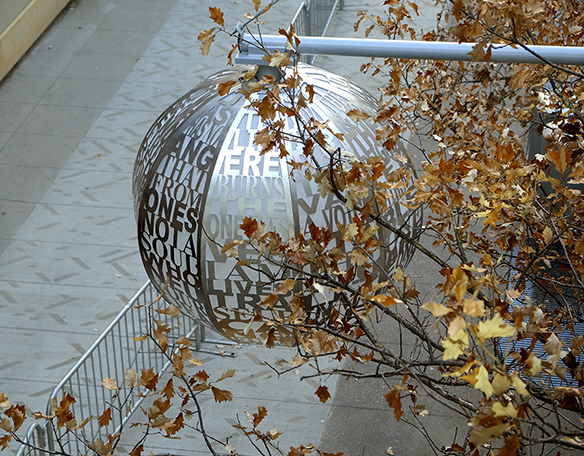 During the day, sunbeams will illuminate the surface of the stainless-steel lanterns creating a soft, diffused glow. 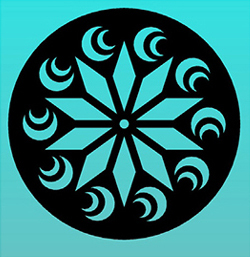 At night, color-changing LED lighting illuminates the artworks from within. 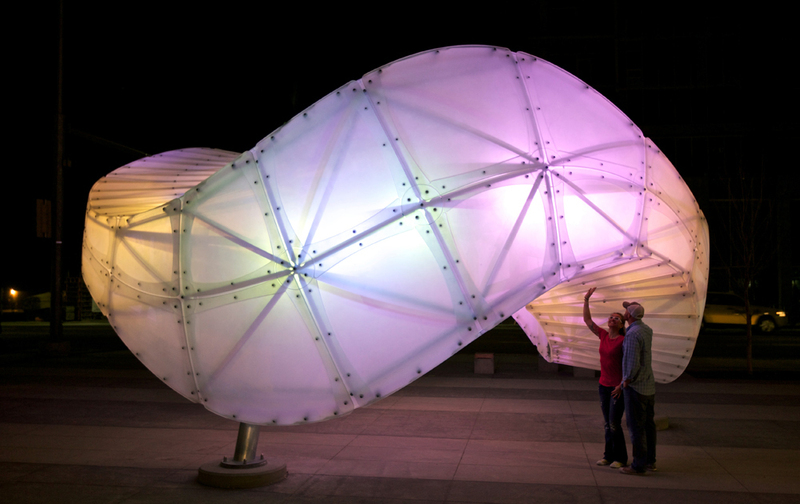 Full-scale prototype was produced to test materials and fabrication methods. 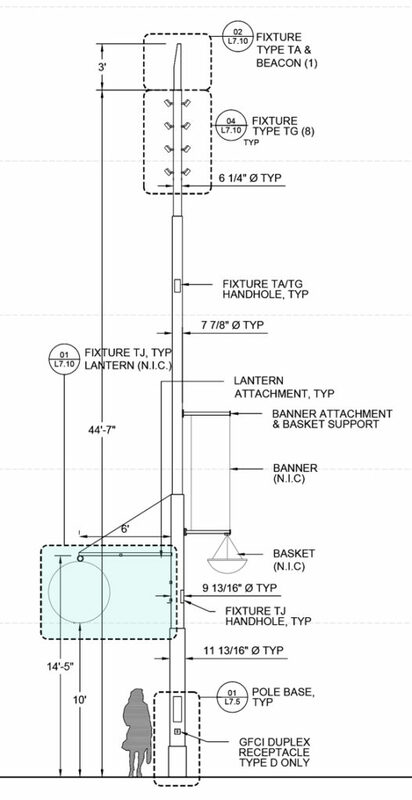 The lanterns will be installed onto light poles with fixtures supplied by the City and suspended at least ten-feet above the ground. 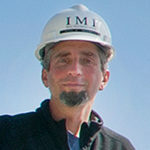 Hancock engaged a licensed structural engineer to design the structural support and anchoring systems to accommodate weight loads and meet safety performance. 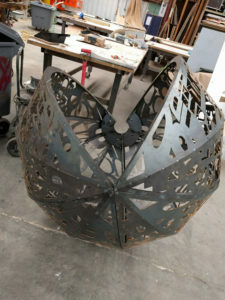 The lanterns will be straight-forward to install because they use standard construction techniques and attachments. These permanent materials cannot be easily damaged. The stainless steel exterior can be cleaned lightly from the ground with a very low psi setting pressure washer and an extending wand with a soft attachment. Periodically, they will have to be cleaned with a lift. An access hatch is integrated into the design to enable maintenance of the sphere’s interior. * What is “passivation”? Passivation is a chemical treatment and cleaning process used to remove iron from the surface of stainless steel providing a uniform passive layer that enhances the corrosion-resistance of the metal’s surface. Stainless steel is different from other metals because from deep within the alloy to the surface, the composition of the metal actually changes. In the passivation process, free iron is removed from the surface, leaving behind a higher chromium-to-iron ratio. Chromium is very stable and corrosion-resistant, but iron is prone to corrosion, so improving the chromium-to-iron ratio improves the corrosion resistance of the surface. 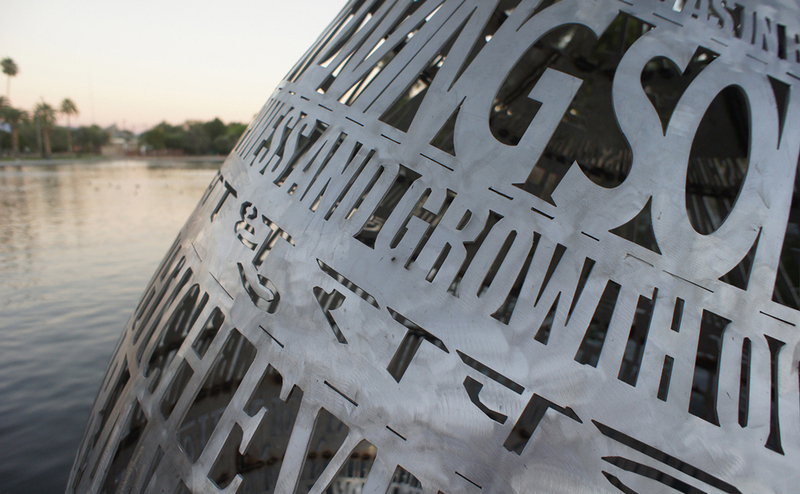 Blessing believes there is enormous potential for public art that is skillfully integrated with the built environment. 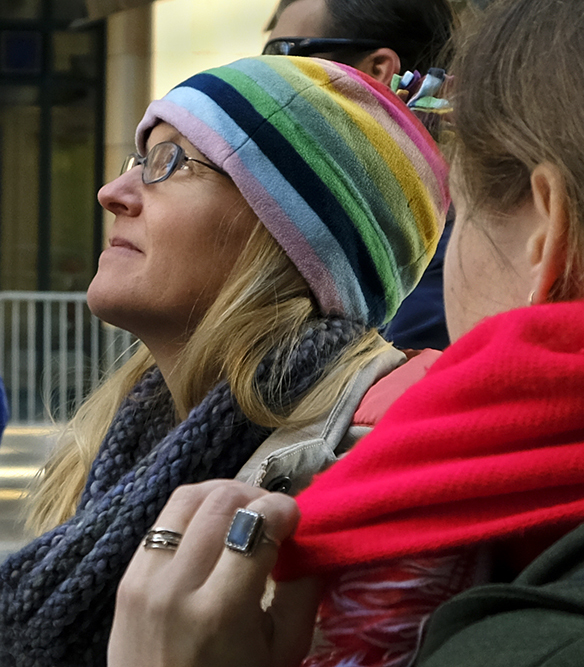 As an artist, her goal is to find new ways we may live with art — ways in which art relates to its setting, enriches the human experience and creates an atmosphere of participation, curiosity, and connection to community. 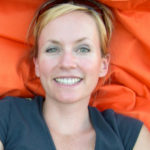 She begins her design process with extensive research and analysis of the characteristics that make each site unique. She says, “I investigate local conditions such as natural systems, cultural touchstones, social history, adjacent communities, and the surrounding architecture and landscape. I observe and discover what is missing in the current condition, and what potential for engagement and celebration could be unlocked by the right art.” Each sculpture becomes a unique reflection of its site and also a powerful landmark on its own. Using a palette of steel, acrylic and colored light allows her to create unique effects. Her acrylic pieces play on the contrast between a weightless translucent form during the day and a colorful glowing object at night. The steel pieces use perforation and projection to transform the surrounding space into an illuminated landscape. Light is the connective thread that runs through Blessing’s work, and she believes in its emotive power and ability to enliven a space. Her work often uses LED lights and touch-sensitive electronics, enabling people to change the work’s color and luminosity and influence its aesthetics. 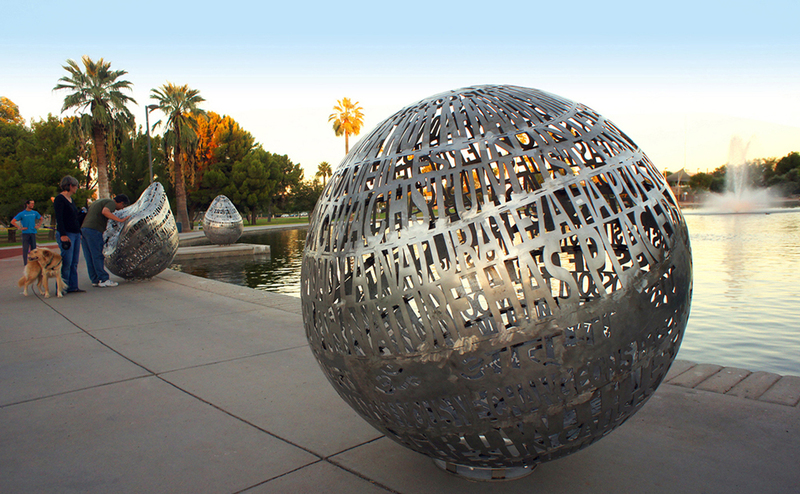 Her company Skyrim Studio in Tucson, Arizona, focuses on public art and works with architects, design teams and community groups. 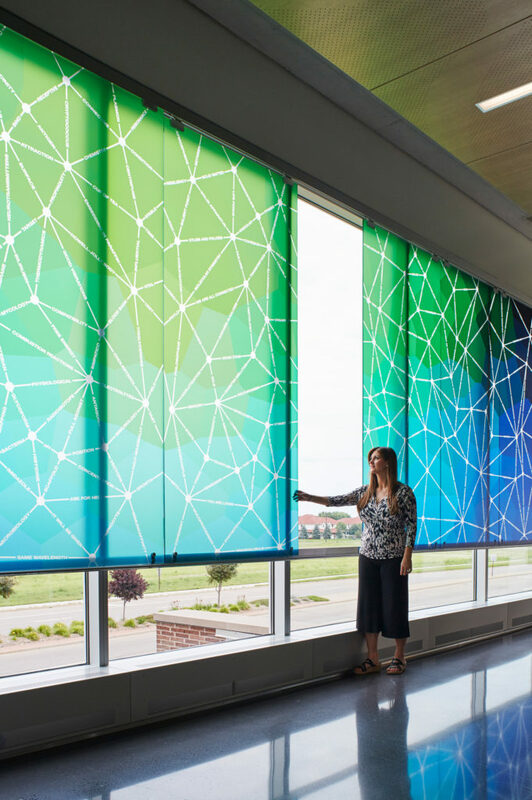 In nearly all of her public art projects, she has coordinated with city agencies, architects, engineers, and consultants to incorporate artwork into new or existing infrastructure. Her studio creates detailed design drawings and produces architectural and mechanical drawing sets for most projects. They have a long track record of working successfully with design professionals and Blessing finds collaborations with community residents, writers and other artists inspiring and rewarding.